Pandowdy? That is what exactly? Pandowdy, according to ochef.com “is a spoon pie, with fruit on the bottom and a rolled crust on top, which is broken up to allow the juices to come through.” It’s an old American dessert typically made with apples. Like an apple pie that got punched in the face and began referring to itself by a funny name. Well, that’s my interpretation. This delightful recipe is an adaption of Mango and Pear Pandowdy from one of my favorite cookbooks, Veganomicon, by Isa Chandra Moskowitz and Terry Hope Romero. Instead of using sugar, I cut the amount of sweetener and substituted with agave nectar, just for a little change of taste. The pears featured in my photos and pandowdy were not Bartlett as the recipe recommends, in case you are a pear expert and question the shape. I only had D’Anjou pears available, which are fine for pies, but best eaten raw. The flavor in Bartlett’s hold up better after heating than other varieties. Bartlett pears have yellow-green skin and are bell shaped as opposed to round. 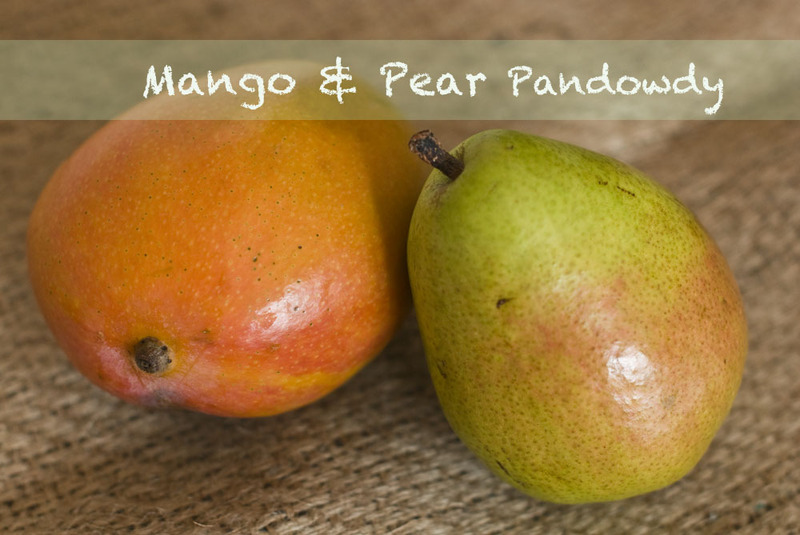 The result of this pandowdy is a juicy bite with a simple sweet taste and a little zing from the mango. I love how easy it was to make! Fifteen minutes of prep for the filling and crust-making. An hour and ten minutes of chill and bake time. I had enough time to make lunch, eat it and read a chapter of a book before fresh dessert came out of the oven. 1: Preheat oven to 350°F. Roll out crust and set aside. 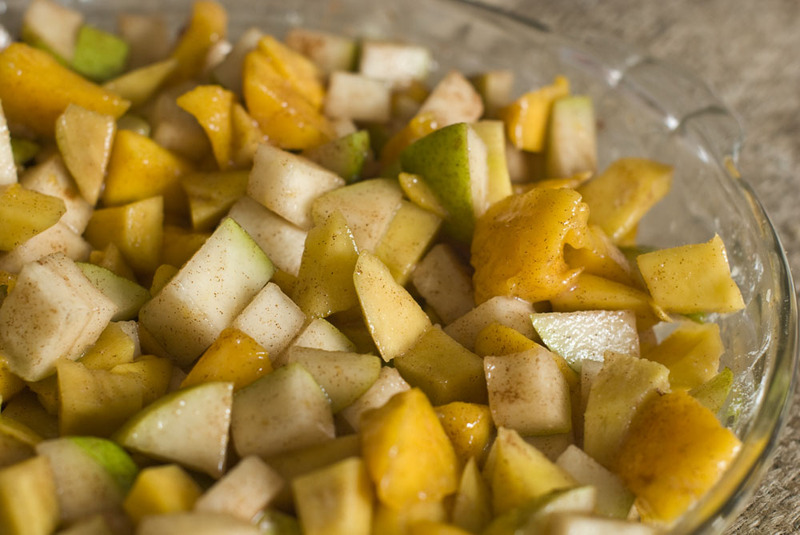 2: Combine fruit, 1/3 cup agave nectar, ginger and cinnamon in pie plate. Stir in arrowroot until fully dissolved. Cover fruit mixture with pie crust and tuck in the edges. Brush crust with remaining agave nectar. Bake for 30 minutes, then remove from oven. 3: Use a knife to cut 1-inch squares into the crust. Use a spoon to mash the crust into the pie. Bake another 20 minutes or until crust pieces are golden brown and filling is bubbling.